The bacterial enzyme Cas9 is the engine of RNA-programmed genome engineering in human cells. Graphic by Jennifer Doudna/UC Berkeley. Discovered last year by Jennifer Doudna and Martin Jinek of the Howard Hughes Medical Institute and University of California, Berkeley, and Emmanuelle Charpentier of the Laboratory for Molecular Infection Medicine-Sweden, the technique was labeled a “tour de force” in a 2012 review in the journal Nature Biotechnology. That review was based solely on the team’s June 28, 2012, Science paper, in which the researchers described a new method of precisely targeting and cutting DNA in bacteria. Two new papers published last week in the journal Science Express demonstrate that the technique also works in human cells. A paper by Doudna and her team reporting similarly successful results in human cells has been accepted for publication by the new open-access journal eLife. “The ability to modify specific elements of an organism’s genes has been essential to advance our understanding of biology, including human health,” said Doudna, a professor of molecular and cell biology and of chemistry and a Howard Hughes Medical Institute Investigator at UC Berkeley. “However, the techniques for making these modifications in animals and humans have been a huge bottleneck in both research and the development of human therapeutics. The latter technique made it easy to generate millions of copies of small pieces of DNA and permanently altered biological research and medical genetics. Two developments – zinc-finger nucleases and TALEN (Transcription Activator-Like Effector Nucleases) proteins – have gotten a lot of attention recently, including being together named one of the top 10 scientific breakthroughs of 2012 by Science magazine. The magazine labeled them “cruise missiles” because both techniques allow researchers to home in on a particular part of a genome and snip the double-stranded DNA there and there only. Researchers can use these methods to make two precise cuts to remove a piece of DNA and, if an alternative piece of DNA is supplied, the cell will plug it into the cut instead. In this way, doctors can excise a defective or mutated gene and replace it with a normal copy. Sangamo Biosciences, a clinical stage biospharmaceutical company, has already shown that replacing one specific gene in a person infected with HIV can make him or her resistant to AIDS. Both the zinc finger and TALEN techniques require synthesizing a large new gene encoding a specific protein for each new site in the DNA that is to be changed. 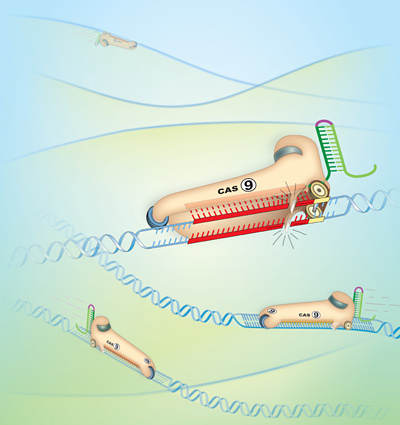 By contrast, the new technique uses a single protein that requires only a short RNA molecule to program it for site-specific DNA recognition, Doudna said. 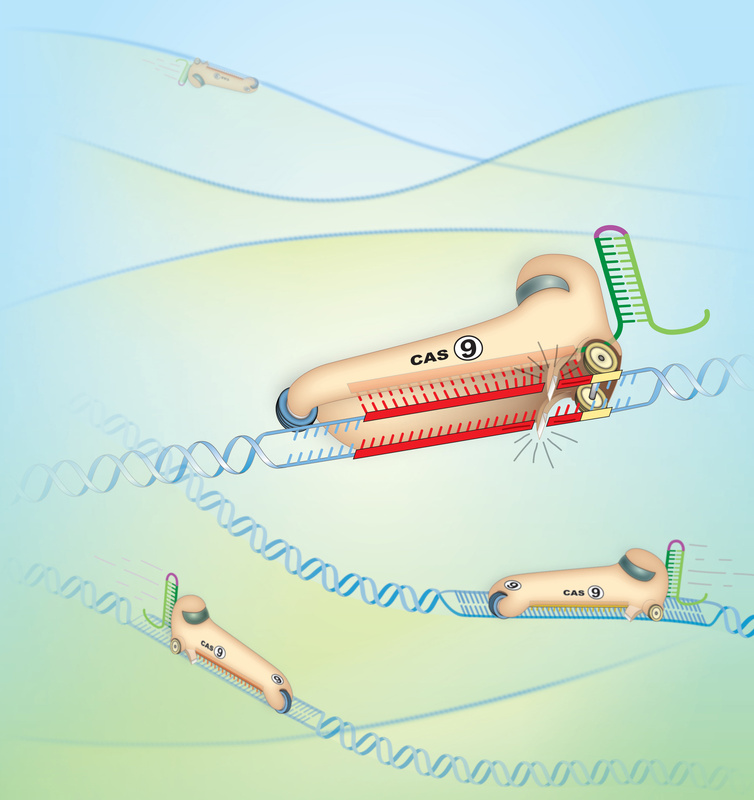 In the new Science Express paper, Church compared the new technique, which involves an enzyme called Cas9, with the TALEN method for inserting a gene into a mammalian cell and found it five times more efficient. “It (the Cas9-RNA complex) is easier to make than TALEN proteins, and it’s smaller,” making it easier to slip into cells and even to program hundreds of snips simultaneously, he said. The complex also has lower toxicity in mammalian cells than other techniques, he added. Doudna discovered the Cas9 enzyme while working on the immune system of bacteria that have evolved enzymes that cut DNA to defend themselves against viruses. These bacteria cut up viral DNA and stick pieces of it into their own DNA, from which they make RNA that binds and inactivates the viruses. UC Berkeley professor of earth and planetary science Jill Banfield brought this unusual viral immune system to Doudna’s attention a few years ago, and Doudna became intrigued. Her research focuses on how cells use RNA (ribonucleic acids), which are essentially the working copies that cells make of the DNA in their genes. Doudna and her team worked out the details of how the enzyme-RNA complex cuts DNA: the Cas9 protein assembles with two short lengths of RNA, and together the complex binds a very specific area of DNA determined by the RNA sequence. The scientists then simplified the system to work with only one piece of RNA and showed in the earlier Science paper that they could target and snip specific areas of bacterial DNA. The three new papers show this bacterial system works beautifully in human cells as well as in bacteria. Doudna’s coauthors include Jinek and Alexandra East, Aaron Cheng and Enbo Ma of UC Berkeley’s Department of Molecular and Cell Biology. Doudna’s work was sponsored by the Howard Hughes Medical Institute.